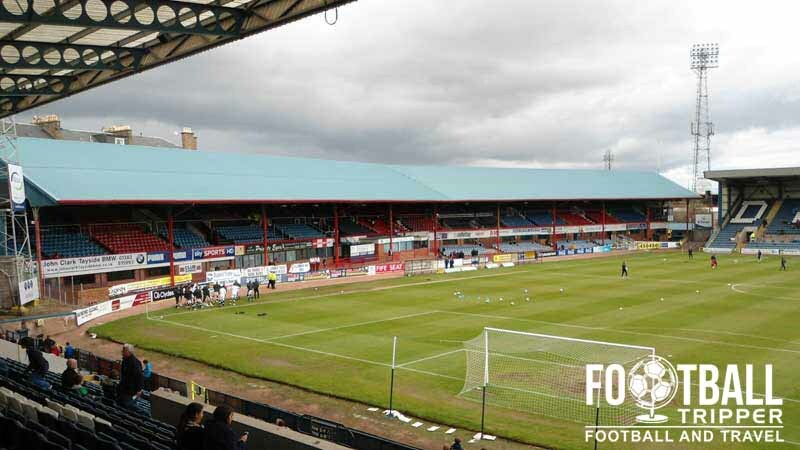 Dens Park Stadium is a 1899 constructed football ground located on Dens Road, Dundee. 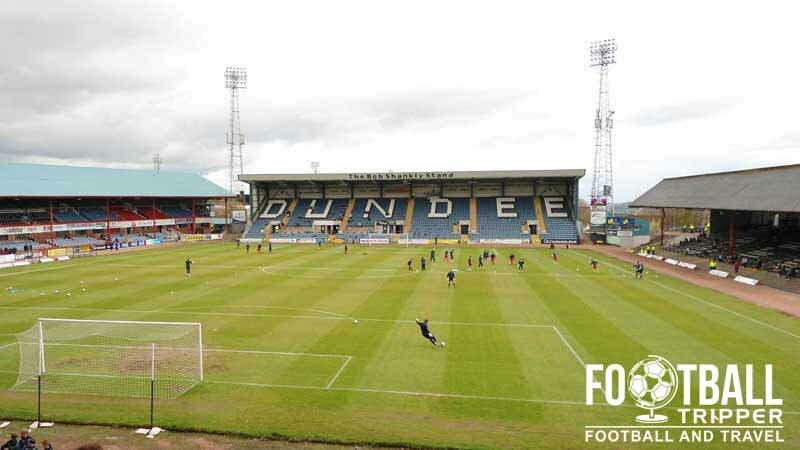 Home to Scottish Premier League side Dundee F.C, the 11,850 capacity stadium shares part of the same road with Dundee United F.C’s Tannadice Park Stadium who are the club’s major rivals. Dundee F.C moved to Dens Park in 1899 exactly six years after the club’s formation after relocating from their former home at Carolina Port. Whilst popular amongst fans future development of the old ground would have been difficult due to close proximity of the harbour and large shale pile known as the “burning mountain”. With the club undergoing organisational change, the new management moved the club to the new location within the Clepington District which has served the club today for over 100 years. 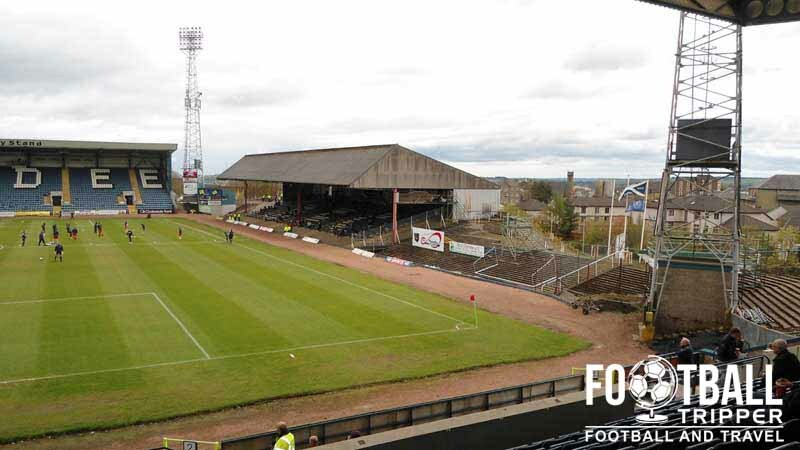 The 20th century saw Dens Park undergo a series of understated redevelopments with the most significant redevelopment coming in time for the 1999/2000 season after they achieved promotion to the Scottish Premiership by winning the old first division competition. The new league had recently set seat-capacity guidelines and to comply with the new regulations Dundee had to redevelop both the East and West Terraces. Known as the Bobby Cox and Bob Shankly stands, doing so in a record time of 82 days. In 2002 the area of Dundee was included as part of Scotland’s bid to host the 2008 Euro Championships and as part of the plan a new stadium was going to be built which would have saw both Dens Park and Tannadice Stadium abandoned for the new facilities under a ground share scheme. With Scotland failing to win the bid the stadium was purely hypothetical with representatives of Dundee both clubs now stating that they firmly oppose a ground sharing agreement. Such is the animosity between the local rivals you could forgive fans for feeling slightly confused when owner John Bennett firstly invested in Dundee F.C before rejoining the Dundee United board of directors, a position he used to hold essentially holding interest in both clubs. Dundee Supporter’s Society have now announced plans to launch an ambitious attempt to buy back the stadium from the conflicted businessman, but whether or not they will be successful remains to be seen. Dens Park Stadium is comprised of four stands: North, East, South and West. Away fans are usually housed within The Bob Shankley Stand which is located behind the eastern goal-end. The usual ticket allocation is set at around 3,000 which fills the entirety of this part of the ground, although further seats can be allocated within the main stand. The city centre is blessed with an abundance of places to drink before the match, with the train station ideally placed to take advantage of this fact. The Nether Inn outside the station exit is a good place to start, followed by The Old Bank Bar, and The Counting House just off of The Howff Burial Ground, both of which are traditional boozers which specialise in real ale. As back up there is the likes of Ticket Boo’s which sells classic pub grub and boasts of stained glass windows for a classy feel, and then a Lloyd’s Bar known as The Capitol. This is a familiar chain housed within a former Cinema giving it a really spacious interior. If you make your way to the ground via Hilltown Road which turns into Mains Road before intersecting Dens Road where the stadium is there are five or six boozers en-route which you could also stop in at for a swift half such as Bowbridge Bar, The Barrels and The Maltman. There are numerous fast-food options to mention within the city centre, so I’m not going to list them all but rest assured that you will certainly not starve. Food options around the stadium are all in similar locations to where the pubs are, with quite a few chippies dotted around the place as well as a Greggs to the left just after Mains Road splits in two. Dundee FC operate a club shop at Dens Park in addition to the very well designed Dundee Direct, which is the club’s official online store. Saturday Match: 10.00 am – kick-off. The glamorous exterior of Dundee FC’s breathtaking club-shop. For more information or to double check opening times you can always phone the store on 01382 889966 (option 2). Like their neighbours, Dundee FC don’t currently offer fans the chance to undertake a tour of the club’s facilities, however if this ever changes we’ll endeavour to update this section. There are also a number of family ticket bundles available within the Bobby Cox Stand which are a great way to save money. 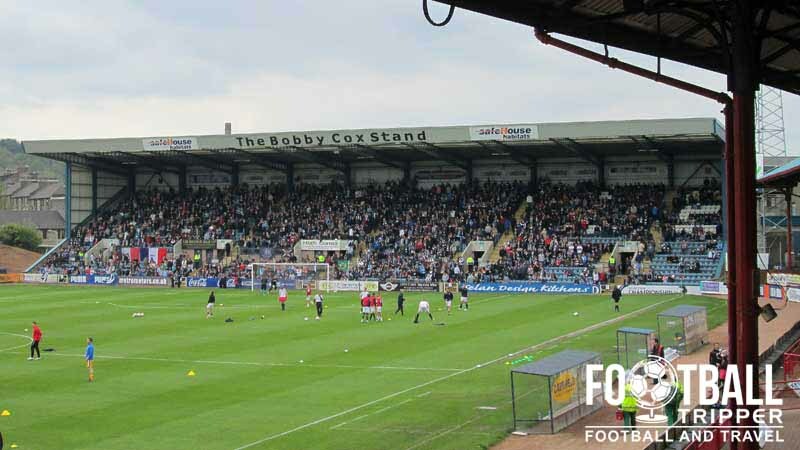 Dens Park is located approximately 2 miles north of Dundee City Centre and The River Tay. Located less than 300 metres from great rivals Dundee United’s Tannadice Park, the two grounds share part of Sandeman Street. Dens Park as seen from outside of the main stand on matchday. On-street parking is available in small quantities around the local area, although you are strongly advised to check, and adhere to any relevant signage. To be safe you can always drive to the city centre where there are numerous car-parks such as at the station. Dundee Train Station is located approximately 1.5 miles south of Dens Road where the ground is, with the resulting distance likely to take you no more than 30 minutes by foot providing that you don’t get lost in the numerous pubs en-route. The exterior of Dundee Train Station. Consistently listed as one of the busiest railway stations in Scotland, Dundee is well connected to Scotland and the rest of the UK with services to the likes of Newcastle, London, Glasgow, Aberdeen and Edinburgh. This makes it ideal for away fans, and ground hoppers alike. From the city centre fans can catch the 1A National Express Bus service to get to the ground. For fans travelling from Glasgow you can either catch a bus service from Buchanan Station within the city centre. For further information and to find complete timetables please visit the City Link website. The closest hotel to Dens Park Stadium is the budget priced Travelodge located on Strathmore Avenue, however you might as well walk a few hundred metres further into the Dundee city centre. Here you will find the even cheaper Dundee Backpackers Hostel, as well as popular chains such as Best Western, Holiday Inn, and over looking the River Tay, a Premier Inn.